Stella Maudine Nickell's small-time world was one of big-time dreams. In 1986, her biggest one came true when her husband died during a seizure, making her the beneficiary of a $175,000,plus insurance payoff,until authorities discovered Bruce Nickell's headache capsules had been laced with cyanide. In an attempt to cover her tracks, Stella did the unconscionable. She saw to it that a stranger would also become a random casualty of cyanide-tainted painkillers. But Stella's cunning plan came undone when her daughter Cynthia notified federal agents. And troubling questions lingered like the secret of bitter almonds... What would turn a gregarious barfly like Stella into a cold-hearted killer overnight? Why would Cynthia, a mirror image of her mother, turn on her own flesh and blood? Did Cynthia reveal everything she knew about the crimes? 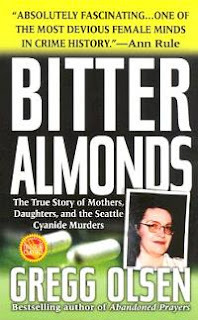 It is a known fact that when performing an autopsy on a person who has died from cyanide poisoning the body releases a strong smell of almonds.Hence this title "Bitter Almonds".This did not happen with the victim Bruce Nickell as an autopsy was never performed on him.It was believed and accepted that he had died from heart complications.The story outlined at the back of this book is slightly misleading as it implies that Stella Nickell,in order to cover her tracks,then laced painkillers in a drugstore with cyanide so that another random person would die as well.The truth is the reason she did this was because the insurance on her husband's life had a double indemnity for accidental death.Her greed was her own undoing.By poisoning another person or person(s)(she didn't care) then her husband's death would be seen as an accidental death and not a natural death via health complications.Stella Nickell had essentially gotten away with murder initially. The investigation then carried out into the cyanide laced painkillers is what unearthed her deadly plan which led to her subsequent incarceration. This true crime story has many sub plots as the other woman who ended up dead from the other cyanide laced painkillers had a history of her own and this is covered in the book.The book is filled with twists and turns as the investigation reveals many potential suspects at first including people in this woman's life one of which was investigated thoroughly.In fact he seemed to be a dead ringer for the crime.At this stage I was left wondering how many innocent people are actually in jail nowadays for crimes they did not commit.Some people are really so unclucky that certain crimes can lead right back to them,even though they are completely innocent. This is a very thick book with 568 pages but the story is really complicated and you need to keep your wits about you to stay on top of this story.Even though we know that Stella Nickell was the actual murderer,the details included in this well written story does lead the reader down the exact paths that I imagine the investigators were led.The book does leave a few questions still unanswered mainly,was Stella Nickell's daughter actually involved in the poisoning?What made her decide to turn her mother in? Did they have a falling out as to what reward Stella would give her for helping?This book was interactive as I was able to come to my own conclusions and any other reader would be able to do so as well.But the point is we would just have our own thoughts.Nothing is ever proven for sure. I read this book in November 2007 and it has 8 pages of photographs.It was an entertaining read but you might have to skim though parts of the book as Gregg Olsen sometimes includes details which are just plain boring and slightly unnecessary and let me stick my neck out by saying "irrelevant". Would you immediately report a family member if you knew they had committed a crime or would you ask questions first and then hope someone else reports the crime? It is amazing what people will do for money. Sadly amazing. as always your review is thought provoking. I'm not very good with words, that's why mine are short. Would I report a family member? That is a hard question to answer. My husband is a deputy sheriff so if it happened around here at some point I probably wouldn't have much choice. Luckily my family as a whole is pretty law abiding, except the few speeding tickets! To bad he did not write about the truth, as she is innocent. 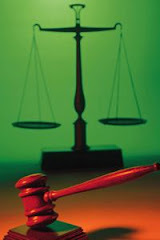 Not all cases involve the odor of bitter almonds. I saw this on Forensic Files. Only about 40% of people can detect it - it's genetic. And not all people will emit it when they've ingested it. His death was initially thought to be caused by emphysema. And she did lace the Excedrin in other bottles to cover her tracks...but also for the reason stated above, to make it seem random so her husband's death would be reclassified as accidental, giving her over $100,000 more in insurance money. Personally, I think Stella's daughter had personal issues with her mother, and when she saw an opportunity to get even, she did. I still think Stella is guilty, but her daughter had no motive to kill her stepfather. And she was already not in her mother's life. I don't think she would have risked killing two innocent people and hope she could get away with framing her mom. But Stella had several motives to kill her husband Bruce Nickell.